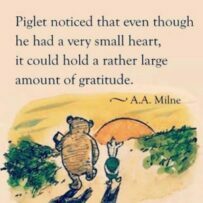 Home » Uncategorized » What are you grateful for today? It’s November and Thanksgiving is around the corner, so it’s time to get your gratitude on! This week a friend sent me the following challenge: write the 5 things you’re grateful for this morning, 5 fears you have this morning, and the 5 biggest things you’re thinking about today. The cool thing was that what I was grateful for (and made me feel good) had no overlap with my fears; so focusing on gratitude keeps me out of a fea rful place. The sad thing was that what I was grateful for had no overlap with what I was thinking about – with one exception: the leftover stew (my grandma’s recipe) that was in my fridge that I was grateful for, and I was thinking about lunch! Gratitude remains the best practice I know for grounding ourselves in the present and shifting our attitudes. It can be a simple pause to say a silent thank you or a weekly journaling practice or a phone call to someone who deserves to hear how much you appreciate them. Or a quick text to a friend thanking them for inspiring a blog post. What are you most grateful for? How can you remember to keep those thoughts in your mind today? Wishing you a very happy Thanksgiving. I’m grateful for you, today and every day.